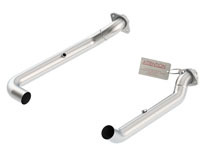 This is an optional, cat delete downpipe kit. It is designed to fit with the Borla Cat-Back™ found in our Turbocharger Upgrad Kit 251004, 251005, 251007 or 251008. It is not intended as a cat delete for the factory exhaust. 2011-2014 F-150 3.5L EcoBoost Automatic Trans.2 & 4 Wheel Drive.